This article is about the microgame in WarioWare: Touched!. For the move in Super Mario RPG: Legend of the Seven Stars, see Big Bang (move). Big Bang is a microgame found in the Touch Training stage in WarioWare: Touched! It returns in WarioWare Gold as one of Orbulon's microgames. The objective of the game is to tap the explosives to make them explode to fireworks. 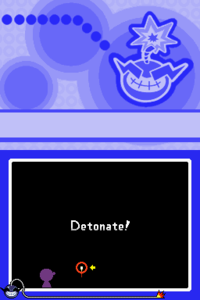 If the player taps the explosives before the time runs out, they win the microgame. If the time runs out and the player has not tapped the explosives, they lose the microgame. If an explosive gets off-screen, another explosive soon appears. 1st level difficulty: The player must tap one explosive. 2nd level difficulty: The player must tap two explosives. 3rd level difficulty: The player must tap three explosives. In the Japanese version of the game, a series of mountains and a bonfire in the shape of the character 大 (large, great) can be seen in the background. This is a reference to the festival Gozan no Okuribi of Kyoto. In localizations, the background is just black. The background music is remixed from the WarioWare: Twisted! microgame Picky Eater. This page was last edited on October 12, 2018, at 20:48.